Welcome to the North High Class Of 1972 web site. On Saturday, September 20, 2014, about 55 classmates and 20 spouses gathered at Sedgwick County Park to celebrate the past and life at 60 years of age. The celebration was made even more special by the fact that the day was actually Cathy (Buttram) Martz's birthday. 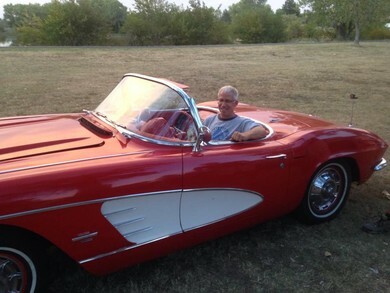 Marc Haynes brought his 1971 red Corvette for us to admire. Robert Benedict sang and played a few songs on his guitar. Jo (Daymond) Weddendorf and husband Bruce brought some excellent beer made by their company, Straight to Ale, of Huntsville, Alabama. instrumental in making this celebration a big success. Please forward or post any photos you may have taken at this event! On Saturday morning, our class was entertained by the current North High School Cheerleaders. The cheerleaders also led us on a tour of the old and new parts of the school. Dale Dunn, former Vice Principal, showed up to greet many of our classmates. Mr. Dunn was heard to say, "The Class of '72 was a very good class." The Class of '52 was touring the school as part of their 60 year reunion. Most of us got back together on Saturday evening at The Brickyard in Old Town. After photo sessions, everyone enjoyed good food, drink, and a lot of catching up and reminiscing. Photographer, Jennifer Pritchard, will be providing a DVD to the class; we will be able to download reunion photos from this site. Check back for updates. Finally, if you have reunion photos you would like to share with your classmates, either post them to your own profile or send them to me and I'll make them available to everyone. If you have made it this far you are very close.